This section is growing. Many of the links are working. Some are not, but will be soon. And new ones will be added as well. Please come back often to find more fun and information! A "mineral" has a very specific definition. Quartz is a mineral but opal is not. Fluorite is a mineral but glass is not. Concrete is not a mineral. Why? Click the rhodochrosite to the right and you will discover the special definition of a mineral. Then we'll put you to the test to identify whether something is a mineral or not. Why agate is a variety of quartz. Is quartz petrified water? Really? Mineral Names: Where do they come from? What do they mean? Minerals are named after people, places, things, properties, colors. They are named from Latin, Greek and Arabic words. Click the picture to the right and discover the world of mineral names. Click the mineral collection picture to the left to discover hints and tips on how to build a really good mineral collection for yourself. Includes information on numbering your specimens, keeping records, making labels and more. What is a gemstone? How are gemstones different from other minerals? Click the amethyst crystal group to the left and discover the world of gemstones. You might even find a gemstone coloring and activity book you can download, print and color. One of the best ways to study and understand crystals is to make some out of paper models. Click the picture to the right and discover "Corundum Carl's Great Crystal Adventure." You will find crystal models to cut, fold and paste. You will even find a recipe for growing crystals at home. ​Saddle-shaped crystals and other Mineral Oddities. Minerals can form in the most interesting and wild shapes. And they are all natural! Explore this link (click the picture to the left) and discover all sorts of mineral shapes. You'll even find a mouse that has turned into a mineral! There are also some fun coloring pages. Copper and other copper minerals. Copper minerals are very colorful. In the United States, fabulous copper minerals can be found in Arizona. Masses and crystals of native copper can be found in Michigan's Upper Peninsula. Click the copper crystals to the right and you will find a 26-page coloring and activity book about copper and copper minerals from Arizona. Minerals have a number of important physical properties. These properties are used to identify minerals. Click on the glassy garnet crystals to the left to discover the physical property of luster in minerals. 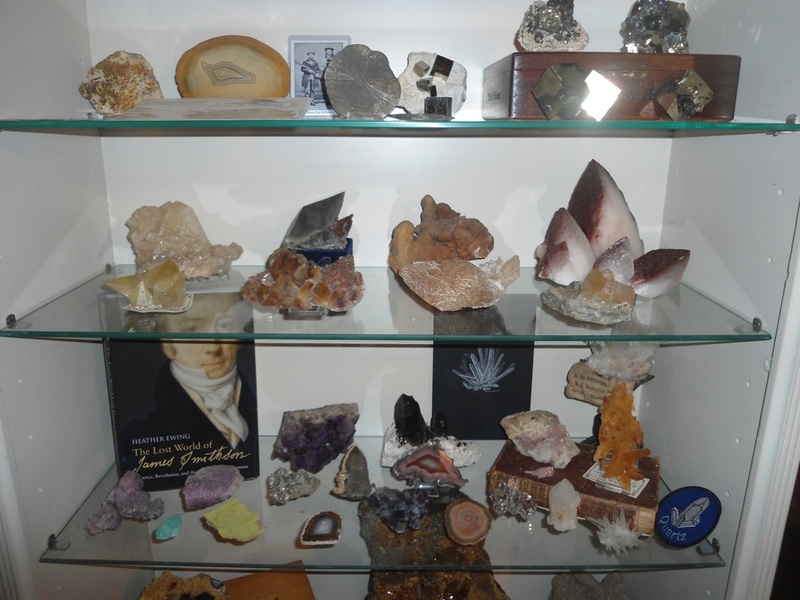 We also have some mineral specimens you can purchase so you can see luster in real specimens. Cleavage is another physical property that is used to identify minerals. Click the octahedral fluorite crystals to the right to discover the physical property called cleavage. You will also learn about specific gravity (and how to make a machine to measure it! ), fracture, streak and more. There is so much to know about fluorite that entire books have been written about this beautiful mineral species. Click the book cover to the left and you will find a 26-page coloring and activity book about fluorite that you can download, print and enjoy. Like fluorite, gold is another mineral species that deserves to have entire books written about it. Click the golden bear nugget to the right and discover the world of gold. You will also find an activity and coloring book about gold you can purchase. Gypsum is around you every day. The walls of your home and the buildings we use are made of plaster - which is made from gypsum. Follow this link for a fun experiment using Plaster of Paris to make fossils at home. Minerals have a lot of fun physical properties that you can explore. Click the calcite picture to the right and find a number of experiments you can do at home or school. Many men and women have contributed to the fields of mineralogy and mineral collecting. Some of these people have minerals named after them. Click the picture of George F. Kunz (a famous gemologist) to the left and you will find a world of interesting men and women. A number of mineral species belong to a group of similar minerals. They crystallize in the same crystal system and have similar physical properties. They have slightly different chemical formulas, though. Click the mica crystals to the right and you will discover a number of mineral groups including micas, garnets, tourmalines, and others. Rocks are not minerals and minerals are not rocks. But rocks are made up of minerals. And there are three types of rocks: Igneous, Metamorphic and Sedimentary. Click the crystals to the left and you will find information on the rock types and the Rock Cycle as well as definitions of "Rock" and "Mineral." When silver is exposed to the air, it reacts with sulfur in the air and tarnishes. This sulfur can be removed using a mineral called borax and a fun chemical reaction. And you can do it at home or at school. Click the silver specimen to the right for directions and information.